Paddle tennis differs from regular tennis in several ways and requires specialized equipment. 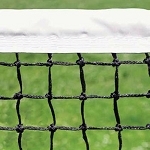 At Tennis Court Supply, we have paddle tennis nets and net posts from Courtmaster, Collins, Putterman, Douglas, and Edwards, all well-respected manufacturers. These nets are correctly sized for paddle tennis courts. The different manufacturers represent a range of prices allowing you to choose high-end equipment or seek out something more budget-minded. Regardless of price, all our paddle tennis nets and net posts are made to high-quality standards and are durable enough to survive the rigors of years of play. If you have any questions about our products, contact us at Tennis Court Supply and we'll share our 30 years of experience to give you the information you need.